That promising candidate finally agreed to join your startup. The contract ink is still wet, and there are smiles all around. The hiring manager included an equity grant to incentivize the new hire to help the company build value over the long term. The candidate is excited to start and plans to be around for years to come—they said so during the interview process. This is the beginning of a new and fruitful relationship. 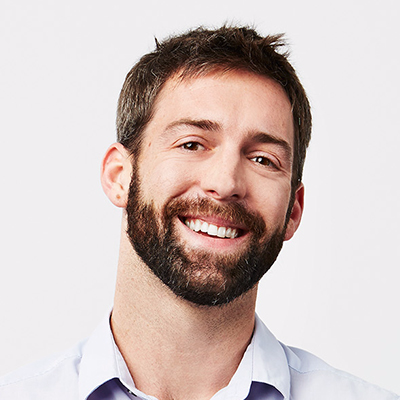 In reality, within 37 months, this new hire will most likely be gone. Hiring and maintaining talent at a startup is hard. The pace within an ambitious company is often frenetic. Product strategies change rapidly. The needs of today won’t be the needs of tomorrow. In a market where ability is at a premium, talented people move around to maximize their chances for success. The startup world doesn’t function like other employment ecosystems. Roles are more liquid, so timeframes are shorter. Carta helps private companies and employees gain visibility into equity ownership. With the anonymous data we collect, we’re uniquely positioned to demystify employee tenure trends. We hope this analysis provides meaningful insights for founders, managers, employees, and candidates. Our sample includes anonymized, aggregated data only. We included employees who received at least one equity award (option grants, RSUs, SARs, etc.). 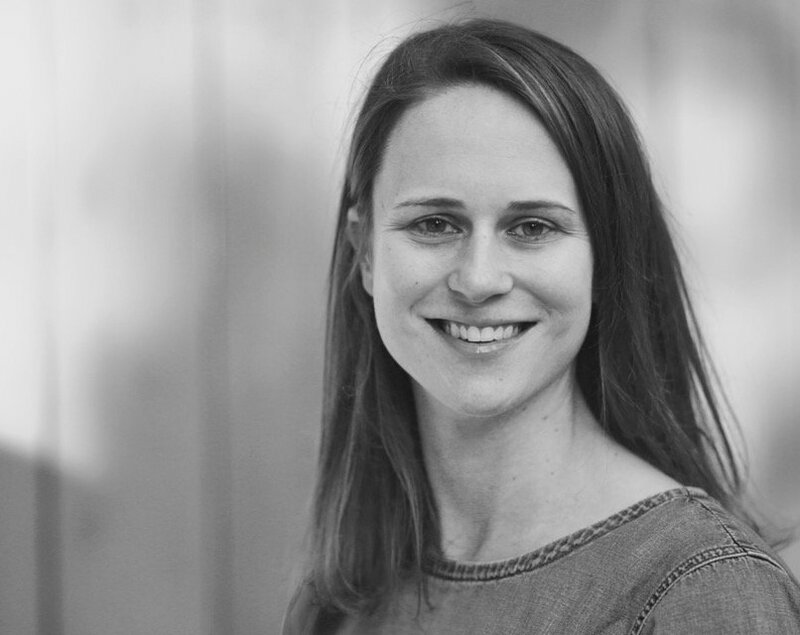 We excluded employees without an equity grant, which we acknowledge could impact our findings. Additionally, we focus on employees while excluding other working relationships like consultants or advisors. For this analysis, we looked at individual employees from their start date for up to 5 years of employment. Carta collects information on termination reasons—voluntary or involuntary—which we use to track why an employee leaves a startup. Aggregate results are used to map trends across all employees in the sample. This sample of our data set contains more than 185,000 employees across more than 3,600 companies in the VC industry. As expected, job tenure at startups is lower than job tenure in other industries. For the US economy broadly, the median length workers stay with their current employer is 4.2 years (US Bureau of Labor Statistics). The median job tenure for startup employees is just 2.0 years. Turnover is most pronounced early in an employee’s tenure. The probability that an employee leaves a startup is significantly higher during the first two years of employment (see Table 1). During this period, companies and their employees are learning whether the relationship is mutually acceptable. As time passes, the likelihood of termination decreases. This suggests that long-term employees and companies have found a stable, working fit. Table 1 also shows the resulting cumulative probability of still being employed at a startup at yearly markers. There is a ~50% chance an employee will no longer be employed with the company after 3 years. Why is employee tenure short? Carta is able to distinguish between voluntary and involuntary terminations, similar to how the Bureau of Labor Statistics reports job separations. Table 2 reports on the data by reason of termination. Voluntary terminations are higher than involuntary terminations across all time periods in our sample. An employee is 10% more likely to voluntarily leave compared to being involuntarily terminated during the first year. This difference grows over time, reaching a gap of 32% (i.e., 44.4% compared to 12.3%) after four years. We can use termination reason to better understand how and when a startup employee will likely leave his or her job. The functional curve of the startup job tenure can be estimated using a classical survival analysis where voluntary and involuntary terminations represent competing factors against continuous employment. 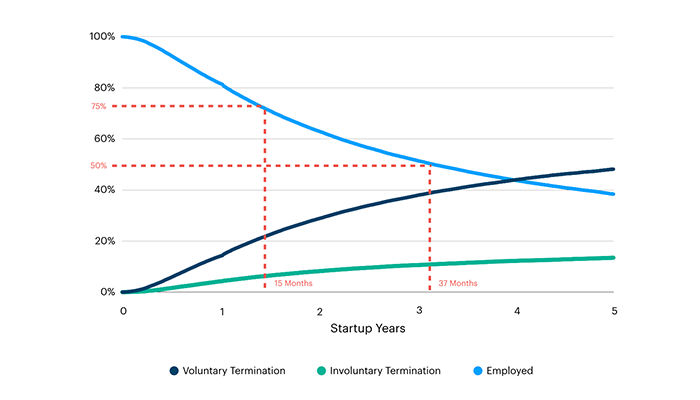 When an employee leaves a startup, termination probability goes to zero after the event (and vice-versa). Graph 1 shows the functional form of continuous employment and both types of terminations over time. As previously noted, the curve for the voluntary termination exceeds the involuntary one curve. Voluntary termination eventually crosses the continuous employment curve at around four years. This is consistent with four-year vesting schedules commonly seen among startups and private companies. After 15 months, there is a 25% chance an employee has left a company voluntarily or involuntarily. At 37 months, there is a 50% chance the person is no longer employed. Another interesting observation about these curves is the discontinuity at the end of an employee’s first year. 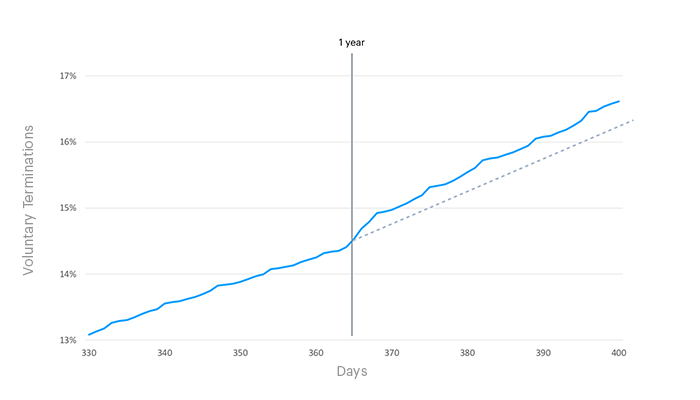 It’s common for vesting schedules to include a one-year cliff, and strategic behavior would suggest that employees consider voluntarily leaving startups when they reach this milestone. The voluntary termination curve flattens towards the end of the first year, and then experiences a noticeable discontinuous increase at the year mark (see Graph 2). This matches industry anecdotes, though perhaps less than one might expect. Chart 2: There is an increase in voluntary terminations at the 1-year mark. Companies and their employees don’t plan for short-term relationships, but that’s often the reality of the startup ecosystem. Alignment of passion and needs can be difficult to maintain when strategies rapidly evolve. Our findings support the broadly held belief that turnover at early-stage private companies is higher than the economy at large. We hope this analysis provides new data points for measuring employment timelines more accurately to benefit companies, founders, and employees alike. These results can also serve as a springboard for deeper discussion. We don’t delve into factors that might be correlated with longer employment length–performance of companies, employee equity stake, employee age, etc.–though we suspect that these could have a bearing on our findings. In future studies, Carta would like to explore these trends in more detail to help our users and potential users even more. Let us know if there’s any data you’d like to see us report on in the future.